Nizwa city is famous for its history, culture, origins and heritage that abound in its customs, traditions, crafts, and the traditional industries and handicrafts our forefathers have known and excelled in as a means of livelihood. The city of Nizwa is the regional centre of A'Dakhiliyah Governorate. It lies around 164 kilometres from the capital Muscat. Nizwa lies at the foot of Al Jabal Al Akhdar (Green Mountain) to the south, amongst the mountains that form its walls. The city is full of rivers, orchards and palm trees towering amidst a balmy atmosphere. This clement weather has made a number of scholars and holy and free men claim Nizwa their hometown, giving it the name “the courtyard of Islam”. The traditional souks “Markets”, the beautiful mosques, the lovely traditional food is sure to make you fall in love with the city of Nizwa. The people here are very warm and yet rigid in the way they think. Interacting with them though is a completely different experience. The language is so lovely, that you would love to take back with you a lot more than just souvenirs from this town. The official language of Nizwa is Arabic with English and Hindi as the secondary language. By Air: The closest international airport to Nizwa is Muscat, at approximately 148 km. Nizwa also has its own domestic airport that mainly services domestic flights. By Bus: One can board "Mowaslat" National Bus from Muscat to Nizwa that run twice daily (at 8.30 am and 2.30 pm daily). By Taxi: You can pick a taxi from muscat airport to reach Nizwa. By Taxi: Hiring a cab would be the easiest and most convenient way to get around in Nizwa. Do remember, however, that taxi drivers do not go by the meter and often dupe foreigners who do not know the going rate. By Bus: The taxi buses are inexpensive and punctual. But it drop off for every passenger until reach the purposed place. By Car: There are a number of options available, by rent a car daily or monthly but perhaps expensive way, however you can purchase second-hand cars from friday morning free market or by olx website. Falaj Daris: A lovely place to enjoy luxury accommodation in the city of Nizwa, it provides you all that you need to enjoy a vacation. Al Diyar Hotel: The Al diyar hotel is clean and well-stocked with all the basic amenities.Great value for money and located close to most important sights. Al-Karam Hotel Apartments: Home-like and comfortable, these apartments give you the much needed privacy and space. They are simply furnished but very well located. Golden Tulip Nizwa Hotel: It is a great option for budget accommodation in the city of Nizwa if you do not wish to spend much and just wish to explore the city. Majan Guesthouse: This is a great option as it is ideally located and is more like a guesthouse. So all your needs are fulfilled and at the same time is quite safe too. Nizwa Hotel: This is also great option, it’s new and lexurus with international resturant. There are many private houses and apartments to rent for long-term stay, which can be done by contract with owners. To search for private accommodation, you can contact directly with property agencies or by olx oman website. AlMandy Al-Dhahabi: Located at City Center, provides tasty Omani and Yemani tradiional foods. scrumptious food and a good ambience, this one will make you want more and more. Dar el Ezz: The locals swear by this restaurant which serves Lebanese and Mediterranean delights. Nizwa Fort coffee house: An old coffee house in the city of Nizwa, you can enjoy some great coffee and traditional Omani delicacies. Bahjat al sham: If you wish to eat traditional middle eastern cuisine, then you should definitely try out the Bahjat Al Sham. Al- Masharef: It is a lovely option for European and Turkish cuisine. Lulu Hypermarket: Located at Farq Villege “entrance of Nizwa City. It’s the biggest Hypermarket in Nizwa, which includes almost everything you need about home stuff, foods, accessories, clothes, furnitures etc. 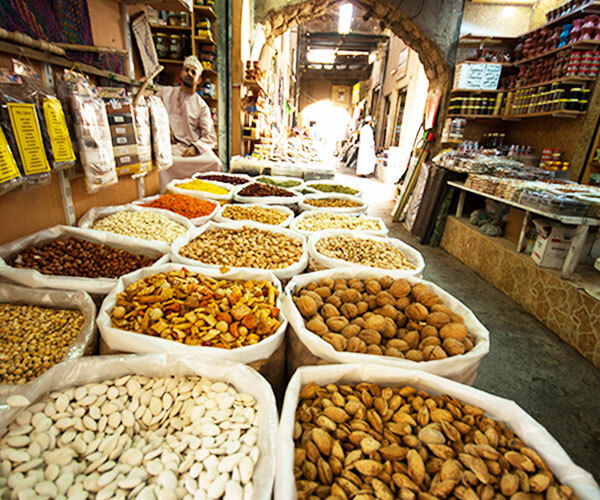 Nizwa Central Market: Located at Nizwa city center, which includes different traditional markets of “Fruits & Vegetables Market, Fish Market, Meat Market, Spice Market and Handicraft gifts Market”also, Goats Market runs every Friday morning. Al-Basma Medical Complex: Also very good complex, has specialized doctors in various areas, contact:25 432 103; Dr. Mustafa at 92 727 014. Alternative Medicine: There are several Ayurvedic clinics in Nizwa, including ones near the Badr Al Samaa Clinic at the Firq Roundabout with a massage at RO 6 per hour (25431902), one near the Souq Roundabout, and one near the Midtown Shell petrol station. Dentistry: In Nizwa, the Haroon Dental Clinic upstairs from Haroon Opticals, just inside the Souq from the Book Roundabout, offers complete basic dental services, at 25412399. Dental services are also available at Gana Clinic across from the university. In Muscat, the Muscat Dental Clinic Service is located opposite the Second Cup in Qurum, and is very popular, so book in advance at 24 568 565. Dr. Anil Ramcrishna is an Orthodontist at the Sala Medical Complex in Al Khuwair at 24485153, and can do root canal therapy, crowns, etc. Health Clubs: There are three options for gym/swimming pool facilities and membership in Nizwa: Falaj Daris Hotel in Midtown is the most expensive, but has two pools (heated and unheated) and a small gym. Golden Tulip is more moderately priced, has a pool and a gym, and is located well outside Nizwa, between Firq and the University. The Nizwa Sports Complex near the College of Applied Sciences is a third option. Hair Cuts: There are many barber shops around town, averaging RO 1/2 -2 for a basic hair cut. The best Western-style beauty salons are located in Nizwa, especially, Al-Ebda'a Al-Turky Barber Shop located near nizwa firq highway. There are a number of national banks in Oman, as well as some international ones, such as the Bank of India, the Bank of Abu Dhabi and HSBC. If you have a foreign bank account, the National Bank of Oman and HSBC ATMs are more likely to accept your debit card. Normal banking hours are Sunday to Thursday, 8.00am-2.00pm. (But see HSBC, below.) To open a bank account, you will need a copy of your passport, resident card and a salary letter from HR.